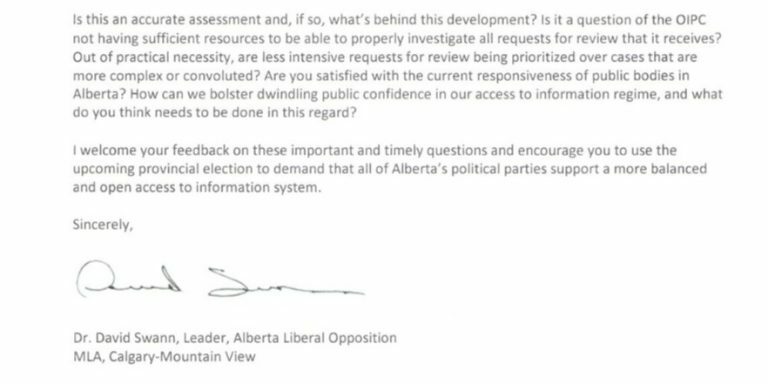 MLA Swann and the Alberta Liberals believe in accountable Government. 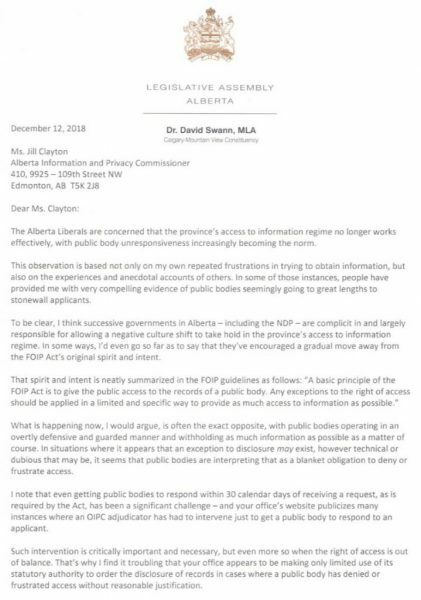 Access to information is deteriorating under the NDP. That is why we’re making our letter to the OIPC public. Albertans have a right to know what their Government is doing. Alberta Liberal Leader David Khan and Liberal MLA Dr. David Swann are relieved the Government and Alberta Health Services are finally implementing a series of Liberal solutions to improve EMS service for all Albertans. But more needs to be done. Khan continued, “We have more suggestions that could be adopted. Paramedics identified misuse of ERs by the public as a major issue. AHS needs to raise public awareness about when and when not to use ERs. We need to maximise the use of advanced technology and create streamlined handover procedures to boost efficiencies. “The overarching issue is reducing access block in our hospitals by providing more community and continuing care. These need to be a long term priority. David Khan and Dr. David Swann are available for interviews. Alberta Liberal Leader David Khan and MLA David Swann issue statement after reports Prime Minister Trudeau will consider rail car purchase and enhanced employment insurance benefits to help Alberta. Khan stated, “We congratulate Prime Minister Trudeau for his willingness to consider funding Alberta rail car purchases to boost oil shipments to international markets. We are also pleased that he will look at temporarily extending employment insurance (“EI”) benefits for laid-off Alberta workers. These two measures will help Albertans enjoy a Merry Christmas. “Alberta’s energy sector has been hit hard. Albertans need help. The oil price differential and new mandated production cuts could lead to more layoffs, with Alberta’s GDP growth predicted to be slashed by up to 50% next year. Calgary’s unemployment rate is already a staggering 8.4%. We must do all we can to help our workers through this troubling time. The Federal Liberal Government will deliver that help, and we appreciate that effort. “The proposal to purchase more rail cars could move 120,000 barrels of Alberta oil to ease pipeline bottlenecks. That increased daily volume will access higher world oil prices which will provide more revenue to pay for social programs in Alberta. It is a medium-term solution, and not a replacement for the Trans Mountain expansion, but it is a step in the right direction. Khan added, “In 2016, the Federal Government provided enhanced employment insurance benefits to unemployed Albertans. It extended EI benefits for unemployed workers for an additional five to 20 weeks, decreased wait times by 50%, and reduced eligibility requirements from 910 hours of insured employment to as little as 420 hours. It’s time for them to do so again. We’re asking the NDP Government to join with us in demanding this action. Prime Minister Trudeau must move faster than he did 3 years ago. Alberta Liberal Leader David Khan and MLA David Swann issue statement on 2019 Provincial Election. Khan stated, “Alberta Liberals welcome the Premier’s confirmation of a Provincial Election in the Spring of 2019. We are gearing up our efforts to rollout a vigorous campaign in the coming months. Albertans will finally have a chance to exercise their choice on the future of this Province. “The NDP have been a failed progressive government that did not deliver to Albertans on key issues such as protecting vulnerable Albertans, reducing classroom sizes, protecting our precious environment, paying down the massive debt, and keeping unregulated dark money out of our political system. They failed to introduce gender pay equity legislation, implement the recommendations of the “Valuing Mental Health” report or provide access to MAID services for all Albertans. “The UCP will gut our social safety net with slash-and-burn spending cuts. They will destroy hard-fought gains for equality, inclusion and tolerance in Alberta. They courted Political Action Committee (“PAC”) money to undermine democracy that will disenfranchise Albertans. They want to turn back the clock to the 1960s. “Alberta Liberals are a forward-thinking, progressive party. We will spend more wisely, not just spend more, like previous governments. We will invest in healthcare and education. We will protect vulnerable Albertans. We will safeguard our precious environment. We are not beholden to big unions or corporations. We will put Albertans first. Swann stated, “I will be working vigorously to help elect Liberal MLAs across this province in this upcoming election. David Khan is available for interviews. Alberta Liberal Leader David Khan and MLA David Swann issue the following statement on National Day of Remembrance and Action on Violence Against Women. Swann stated, “On December 6, 1989, 13 female students and a female administrator at l’École Polytechnique de Montréal were murdered because they were women. Khan stated, “We celebrate the of tearing down of patriarchal values and institutions that treat women unfairly. That is real progress. But, we must also guard against aggressive, misogynistic worldviews. They are pushing back, sometimes violently. This hate poses great risk to all people. “We must continue to make progress on gender equality issues. We must prevent all forms of violence against women. “Alberta Liberals are advocating for more women’s shelters funding. 16,722 women, children and seniors were turned away last year. That cannot continue. We believe there should be greater focus on the root causes of violence against women. Alberta Liberal Leader David Khan and MLA David Swann are asking Premier Rachel Notley to join with them and call for the Prime Minister to reinstate extended federal EI benefits at the First Ministers’ Meeting. Khan stated, “The Prime Minister must do more than just talk about the oil price differential crisis. He must understand its impact on Alberta jobs. We want him to reinstate extended federal EI benefits. We want Premier Notley to strongly deliver our message this week. Albertans do not want more words. Albertans want action. Khan stated, “We know Albertans want to work. But if they can’t get a job, they need help. The oil price differential and new mandated production cuts could lead to more layoffs. Calgary’s unemployment rate is already a staggering 8.4%. We must do all we can to help them through this troubling time. “Bank of Montreal’s economists forecast the oil production cuts will have a harsh effect on Alberta’s economy. They estimate Alberta’s 2019 GDP annualized growth may be cut in half from 2.4% to 1.2%. TD Bank’s economists echo those forecasts, predicting Alberta’s GDP growth could fall to as low as 1.1% from 2.3% next year. Those are serious hits to Alberta’s economy. They will hurt Albertans. Alberta Liberals support the Government’s temporary oil production cuts as an emergency intervention to bolster prices. But, we also have concerns about execution and unintended consequences. There could be negative impacts on jobs. The Prime Minister and the Federal government must step up with action, not more rhetoric. Albertans need help now.